Using Fax to Email is simple. Use the quick start guide below. 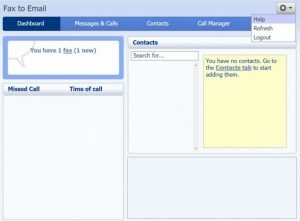 Visit hbci.com/customers/fax-to-email to access Fax to Email with the online Call Management Portal. Access and manage your Fax to Email features online. Use the built-in step-by-step instructions by navigating to Help under the gear icon in the upper right of the portal. *Your online web password and telephone PIN number will be different. For security purposes, the online portal will prompt for your password to be changed every 180 days. If you have not accessed your online account in excess of 180 days, and need assistance with your password, please call Wizards Technical Support at (877) 457-9669.